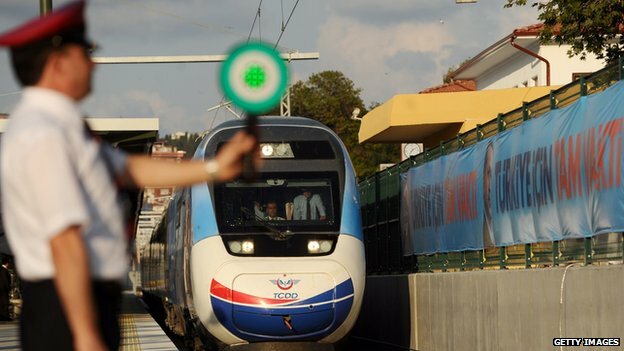 Turkey’s first high-speed train has broken down just a few hours after the prime minister inaugurated it in a glowing speech about the country’s technical prowess, it’s been reported. The glitch happened when a dislocated contact wire cracked the windshield of the sleek new train, and the electricity had to be cut for 30 minutes to fix the problem, Hurriyet newspaper reports. “You should have no doubt,” Erdogan added. “Aren’t we now producing our own helicopters? We are. Are we starting to produce our own local tanks? We will move further.” He went on to describe Turkey as a country that turns its dreams into reality. The train’s maiden journey comes less than three weeks before Turkey’s first-ever direct presidential elections. The $4bn (£2.3bn) project was completed in phases between 2009 and 2014, with $183m from the European Union. Erdogan said he hopes Turkey will become one of the world’s 10 largest economies by 2023. “A dislocated contact wire” – looks like they’re no better at wiring their railway than I am! This entry was posted in Out and about, Prototype, Weird and wonderful and tagged prototype, railway, turkey. Bookmark the permalink.